USFLEX®| Protective Safety Equipment Bonaire - SOS Safety Int. Inc. The unique straight-warp carcass of UsFlex® is engineered to provide outstanding rip, tear and impact resistance. Made to be flexible and lighter weight, UsFlex®offers execllent load support, troughability and tracking. The unique straight-warp carcass of UsFlex® is engineered to provide outstanding rip, tear and impact resistance. Made to be flexible and lighter weight, UsFlex®offers execllent load support, troughability and tracking. 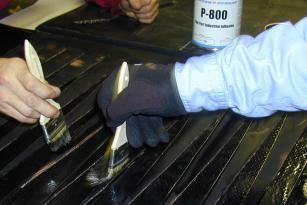 Offering both high strength and abuse resistance, UsFlex® is a clear choice for your most punishing applications. 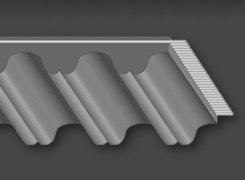 UsFlex® Belting has longitudenal rip resistance more than three times that of multiple-ply belts of equivelant rating because of our unique straight-warp construction. UsFlex® provides impact resistance up to three times greater than that of conventional plied belting. 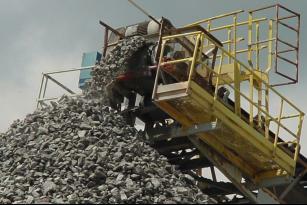 This unequaled toughness means the belt will not easily be damaged in the loading and conveying of large, sharp material. 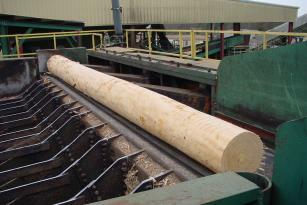 As a result, UsFlex® will provide the longest belt life in the harshest conveying conditions, guaranteed. 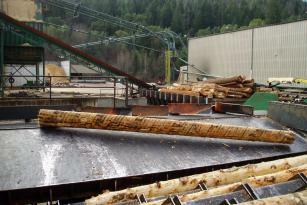 You Need UsFlex ® High Performance Series Conveyor Belts! Fenner Dunlop Engineered Conveyor Solutions revolutionary new concept in straight-warp conveyor belting – the UsFlex® “S” and “D” Series – incorporating both carcass style and tension rating. 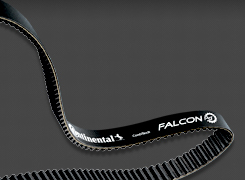 The “S” Series represents the UsFlex®Single Unit belts and the “D” Series represents the UsFlex® Dual Unit belts. UsFlex® is manufactured within a high performance Series of specifications that meets the needs of the conveyor belt industry’s toughest applications. Consistently on the cutting edge of Splicing Technology, Fenner Dunlop has taken its Finger Splicing Technique one step further by developing a procedure that makes Finger Splicing straight-warp belts less time consuming, less expensive and easier to perform. 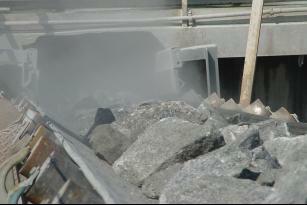 A dynamically lab tested and field proven method of splicing that will result in optimum operating capacity. Excellent performance in serpentine or “S” type drives. 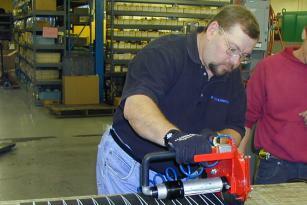 Greater splice flexibility than any other splicing method in the industry. Less chance of damage due to cutting and buffing the strength members of the fabric plies when preparing and stripping the belt ends. Life cycle four times greater than conventional step splices done on conventional multi-plied or straight-warp conveyor belt constructions. Versatility in installing the Finger Splice on a bias or square. Value added services continue to make the difference in winning and maintaining customer business in a competitive market. Fenner Dunlop hasestablished a Certified Splicing Program geared to educate its distributor network. The Fenner Dunlop Splice Management team customizes each training session to ensure that participants increase skill level and knowledge base in the areas needed to improve their level of service to their customers. 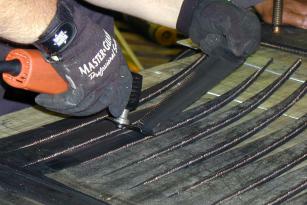 Highly skilled Certified Splice Technicians are on call to assist and to supply the end-users with the latest technology, materials and full endorsement from Fenner Dunlop when proper procedures, techniques and materials are used. There are numerous advantages to being a member of Fenner Dunlop’s Certified Splice Network. Participation in Fenner Dunlop National Contracts. 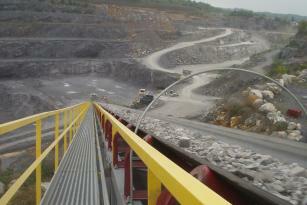 Partnership with the conveyor belting industry leader in technology and support. Member of Fenner Dunlop Distributor Gold Crown splicing support network. Increased skills, education and training in the most advanced rubber technology and splicing science for Belt Technicians. Less customer downtime due to decreased splice failures and proper installations. Premium for highly skilled and educated service Technicians. Why special compounding for splicing? 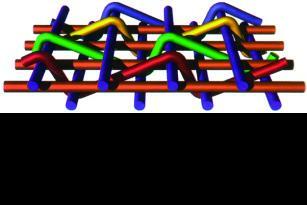 Dynamic & static properties of splice materials. 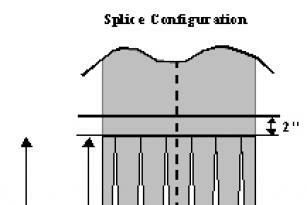 Fundamentals of splice design & failure analysis. 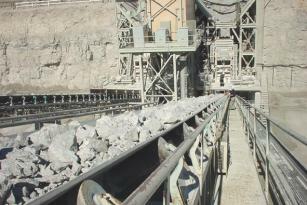 Splicing of multi-plied and straight-warp conveyor belt constructions. Fenner Dunlop Finger Splice Technology for Straight-warp I & II constructions. Fundamentals of Steel Cable splice design & failure analysis. Current Steel Cable belt splicing techniques and procedures. 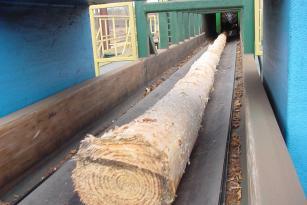 Longitudinal rip resistance five times that of multi-ply belts of equivalent rating. Impact resistance up to three times greater than that of conventional plied belting resulting in less damage to the belt. The combination of our straight-warp UsFlex® carcass with specially compounded rubber covers creates the toughest conveyor belt available today. While traditional plied belting utilizes a conventional crimp-weave fabric in plain or crow’s foot patterns the UsFlex® straight-warp carcass construction incorporates a completely different concept. 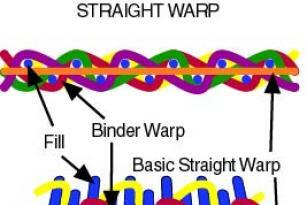 The lengthwise and crosswise belt strength is concentrated in parallel planes of heavyweight, high-tenacity straight yarns which are then locked together by a unique binder system. Each of these planes provides the reinforcing effect of multiple plies of conventional fabric with no crimping to weaken the yarns and cause stretch. The carcass binder system acts as a built-in breaker to resist impact and puncture. 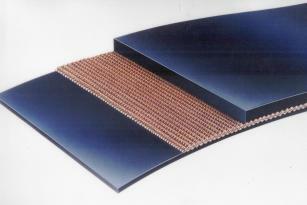 Balanced cover ratios are extremely important in conveyor belt manufacturing. 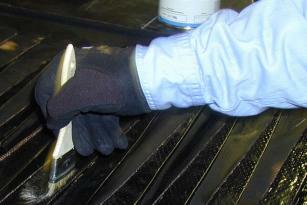 Conveyor belt cupping, curling and tracking problems are greatly reduced with a well-balanced conveyor belt. 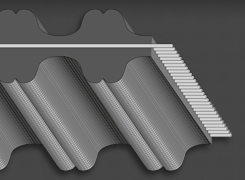 UsFlex® takes this concept a step further by incorporating a top to bottom cover thickness ratio that will insure correct troughability in the most stringent appications. Available in widths to 96″ with tension ratings to 550 PIW (96 kN/m) and manufactured with pulley cover gauge at least one half of the carry cover gauge. Available in widths to 96″ with tension ratings to 1500 PIW (262 kN/m) and manufactured with pulley cover at least one third of the carry cover gauge. A wide variety of rubber covers can be applied to the UsFlex® carcass to safely convey products like hard rock, coal, impact minerals, ores, logs, aggregate and grain. 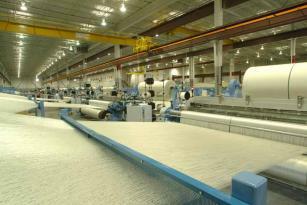 A new state-of-the-art loom located in the Atlanta facility is fully dedicated to weaving Fenner Dunlop’s UsFlex® straight-warp fabric. This technology allows us to react quickly to our customers’ needs.